What length should your dogs nails be? As owners we all have different schedules when it comes to our dog grooming habits. But in our rush to accomplish all our daily tasks we could inadvertently causing our dogs stress. To avoid this happening & work through the process if your dog does suffer any anxiety during the grooming process. Firstly we need to start with desensitisation and making this process safe for you and your dog. We need to be confident with the tools and techniques we are going to use before we even think about snipping a nail. It is not something anyone likes to do but for your dog’s sake it must be done. Keeping your dog’s nails short is essential for your dog’s health and wellbeing. This should be a calm experience for you and your dog, as there is nothing worse or potentially dangerous than a dog that stresses and struggles when having their nails cut. Dogs today are increasingly confined to our homes while we are at work; we tend to run them mostly on grass when they are outdoors which does not give the desired effect on controlling nail growth. However walking or running on various hard surfaces, including pathways and hard standing playground surfaces, will aid in gradually wearing down the nail, meaning less of a need for formal nail-grooming, after all prevention is always better than cure. 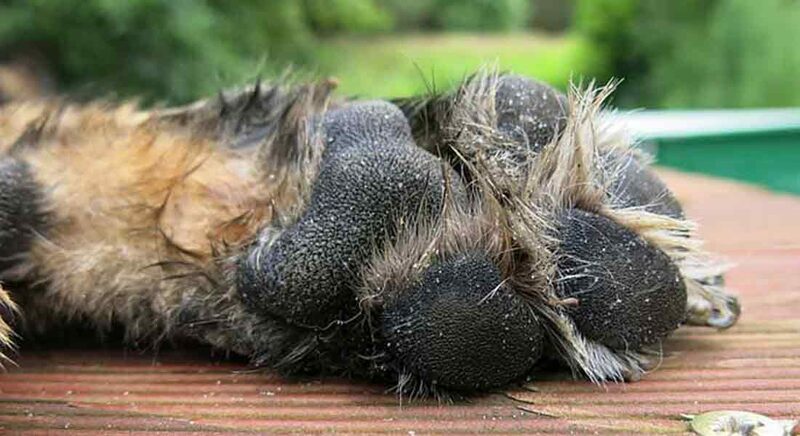 So you may ask why trim a dog’s nails? Well long nails can cause serious damage to the health of your dog. Nails that protrude or turn under will constantly put pressure on the nail bed when they touch the ground, this can cause extreme pain for the dog. If left long term it could actually start to affect your dog’s joints and in the end could become a vicious circle as it will make any contact with the paw painful for the dog, so they avoid having them touched. If their feet have been neglected for a long period of time, it might take you months to shorten the nails to a healthy length. Remember the longer the nails the longer the quick (which is the internal vein) will become, but if you keep walking your dog and trimming just the end of the nail then this process will get easier. What we are looking for is that the nails sit flat when they come into contact with the ground. This then will help wear the nails down and assist the quick to recede. Cutting your dog’s nails is not a case of buying a trimming tool from the local pet store. You need to make sure you are confident with the process or you could cause more problems. If you find yourself struggling and lacking the confidence to proceed with the trimming yourself, either seek Veterinary advice or take your dog to a qualified professional dog grooming facility.